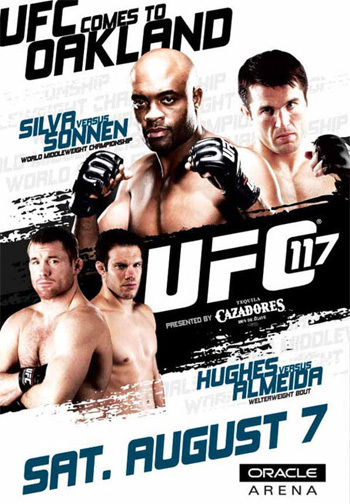 With one of the longest mixed martial arts lulls of 2010 upon us, the sport’s biggest promotion has decided to announce the finalized roster for “UFC 117: Silva vs. Sonnen” on August 7th. The show will be jumping off inside Oracle Arena in Oakland, California. Controversial middleweight champ Anderson Silva will defend his strap against Chael Sonnen, who has emphatically emerged as MMA’s most articulate and entertaining smack talker. The bitter rivals will throw down in OakTown to determine who the planet’s top 185-pounder is. When challenged, the Brazilian has displayed a vicious arsenal that’s sent most into unconsciousness. Although he hasn’t showcased his marksmanship over his last three lackluster title defenses, “The Spider” claims his mojo is back and he’ll be badder than ever. Sonnen, on the other hand, has promised that a new king will be crowned if the vintage Silva doesn’t return. A welterweight top contender bout between Jon Fitch and Thiago Alves will co-headline the pay-per-view broadcast. In their initial meeting at “UFC Fight Night 5″ back in June 2006, Fitch managed to land a vicious up-kick to Alves’ grill in the 2ndRound that ultimately put him out. A rematch had been booked for UFC 107 in Memphis, but the Brazilian suffered a knee injury and was forced to withdraw. Then, the welterweights were all set for UFC 111 in March until the New Jersey State Athletic Control Board pulled the plug on Alves just days before showtime after a pre-fight CT revealed a brain abnormality. Alves underwent successful surgery shortly after and has been back in the American Top Team lab honing his skills for the pivotal mulligan.